Walker Hancock, sculptor, from Gloucester, MA was one of the real "Monument Men"
The most recent movie from Hollywood entitled "Monument Men"was based on a true story during our past World War II era. Walker Hancock, a sculptor from Gloucester, is portrayed in this film by actor John Goodman. The historical and artistic significance of this film illustrates the importance of art and sculpture as Deanie Hancock French, daughter of Walker Hancock, says: "As citizens of the world we rely on the threads of all the people who came before us. It's a lively movie and gets the story. It romanticizes some things but it delivers the message — we must not desecrate our human history." Sculptures and paintings of the past are all our concerns. They commemeorate and define our lives. Art is what makes us human. All civilizations must respect, nurture and protect it, for all posterity, even if we have to risk our lives for it. Hancock went on to receive after the war the National Medal of Art and National Medal of Freedom. He is responsible for creating the portrait busts of Presidents George Bush, Abraham Lincoln and James Madison, Chief Justice Warren Burger, poet Robert Frost, Gen. Douglas MacArthur and Rev. 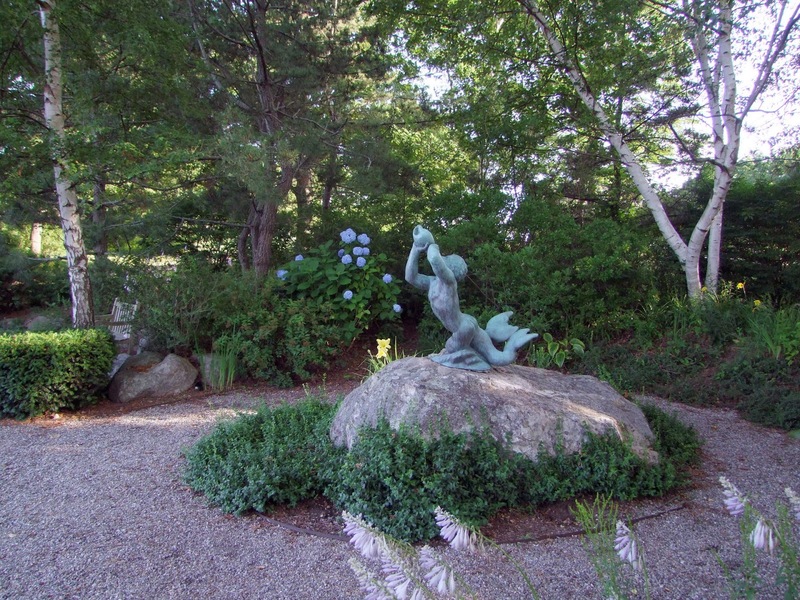 Martin Luther King Jr..Here below a light hearted mythical ocean creature"Triton""enhances the public gardens of "Stacy Blvd Gloucester, MA. Art and sculpture have meaning and value for all of us. Happy Birthday! George Washington by Thomas Ball, Charlestown, MA sculptor. Sculptor Thomas Ball created this equestrian statue of George Washington which was cast, mounted, and dedicated in 1869. The statue’s sword has been broken so often by vandals that it was finally replaced with fiberglass. The plaster study of it is on display in the Boston Atheneum Reading Room. Since 1776, George Washington has been called The Father of Our Country by his fellow Americans. If there was an American Mount Olympus, Washington would be at the pinnacle. Since the 1790s his image was everywhere on paintings, coins, prints, plates as well as seen here as a statute. John Adams once said that George Washington had “the gift of taciturnity,” meaning he had an instinct for the eloquent silence. Here depicted as the resilient Military General of the American Revolution, not obsessed with winning battles but stead fast in his will to keep his Continental Army surviving and alive, wearing down the will of the British Army. George Washington’s strength, whether it be military or political, was in his ability to surrender his omnipotent power as a leader in both positions of leadership. Happy Birthday to George Washington, father of our country, from Joe Gallo author of "Boston Bronze and Stone Speak To Us"another celebration of great American events and people through the medium of Boston Statues and Monuments. "Boston Bronze and Stone Speak To Us"can be purchased At Bestsellers Bookstore Cafe, Old North Church Gift Store, Amazon.com and Barnesd & Noble Book Stores.